There were four ships in this class built for the US Navy, the others being Saratoga, Ranger and Independence. These ships were the world’s first super carriers ‘designed’ with an angled flight deck. The angled flight deck first appeared on converted British carriers to allow aircraft to take off from the angled deck and from the front of the ship at the same time. Also, aircraft can land on the angled deck while others are being launched from the front of the ship. This means if an aircraft misses the arrestor cables on landing, it can again take off from the angled deck without hitting aircraft at the front of the ship. Forrestal’s first mission was to bolster US Navy forces in the Mediterranean during the Suez crises of 1956. On her second deployment to a war zone, she began operations from the Tonkin Gulf off the coast of Vietnam July 25th 1967. 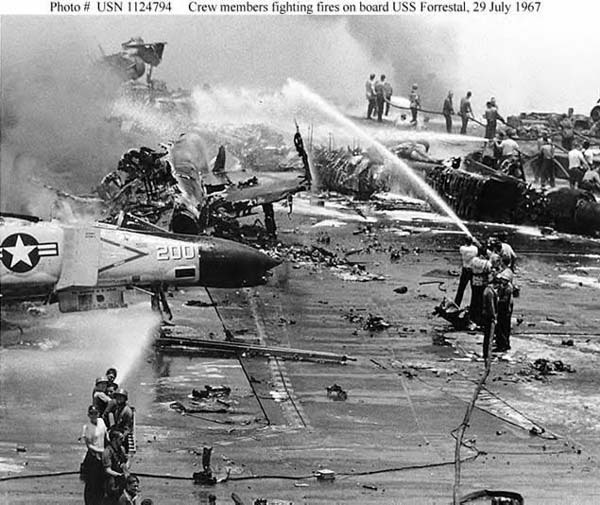 Four days later, Forrestal’s aircraft were being prepared for a strike on North Vietnamese positions when a rogue missile from one jet fighter on her flight deck malfunctioned and hit an aircraft opposite. This set off a chain of explosions as other heavily armed aircraft were lined up along the flight deck waiting in turn to be launched. Many of Forrestal’s crew risked their lives as they fought relentlessly to save their ship by extinguishing the fires and clearing the exploding aircraft from the deck. This incident led to the loss of 134 crew and 21 aircraft. Although extensively damaged, Forrestal managed to make it back to America to undergo repairs at the Norfolk Navy Yard. Forrestal joined the US fleet based in the Mediterranean after returning to service in 1968. In 1977, the navy selected her to test their newest aircraft, the Grumman F-14 Tomcat. After these extensive trials had been completed, Tomcats were deployed on US carriers from 1986. Forrestal was operated in the Mediterranean during the Libya/Israel missile crises in the early 1980s. Throughout that conflict, her aircraft were credited with intercepting over 60% of the Libyan aircraft. Forrestal’s final deployment to a war zone in 1991 saw her aircraft used to the protect Curds in northern Iraq from Iraqi forces. The following year, she replaced the US carrier Lexington as America’s premier training ship. Since that roll ended September 30th 1993, she has been moored at Philadelphia Naval Yard awaiting her final destiny. USS Forrestal in port Large Image. Many people believed the world's first super carrier should have been retained as a museum and historical center. A veterans group were lobbying for over ten years to have the decommissioned Forrestal based at Baltimore to serve as a museum. The navy are now considdering preparing the ship to be sunk as a deep water artificial reef. Saratoga is currently laid up at Road Island while a campaign is under way to have her based at North Kingstown/Road Island to serve as a museum. Ranger was decommissioned 10th July 1993 and laid up at Bremerton. As of 2004, a nonprofit organization began working to take the Ranger to Portland/Oregon to serve as a naval museum and educational center. Independence was placed in reserve at Puget Sound Naval Shipyard in 1998 after being replaced at Yokosuka by the carrier Kitty Hawk. Her poor condition has recently led to the navy listing her to be sunk as an artificial deep water reef. 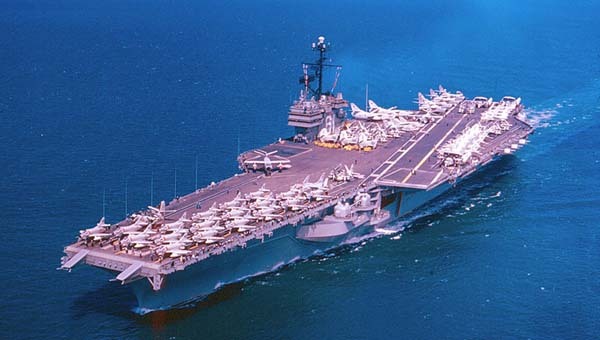 The four Kitty Hawk class carriers began entering service from 1961. These carriers were almost identical in size.